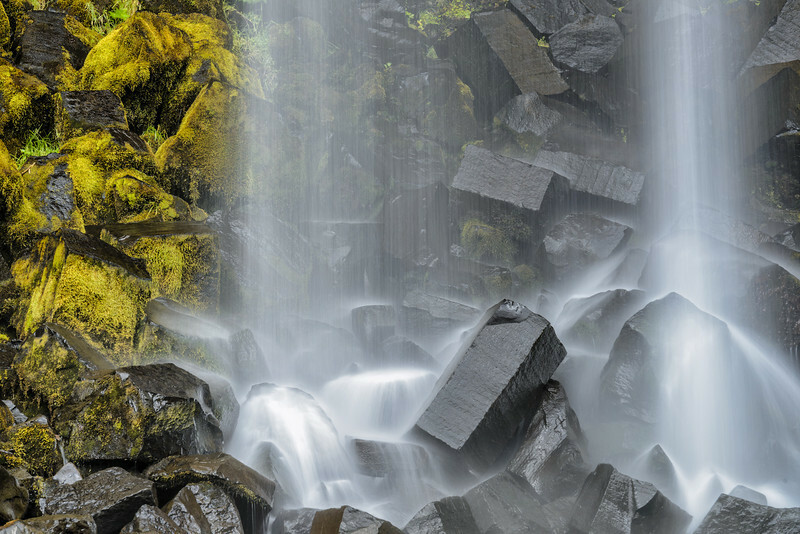 In the last part of my Land of Fire and Ice blogpost series, we will have a look at some of Iceland 's magnificent waterfalls. 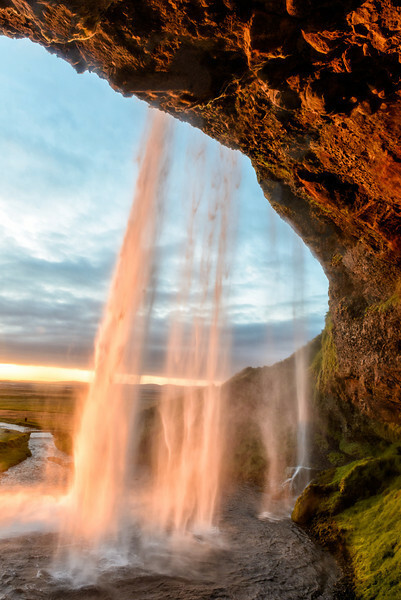 The Hvita river plunges into a two step waterfall of 32m. 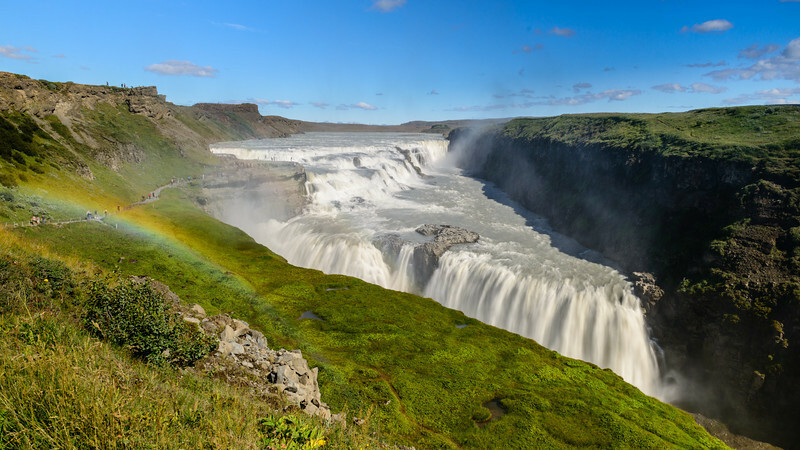 Ofaerufoss in Central Iceland is a far less popular one which can be reached after a 45min hike along the river bed. It used to have a spectacular natural bridge over the falls, which collapsed in the early 90's due to a rockslide. 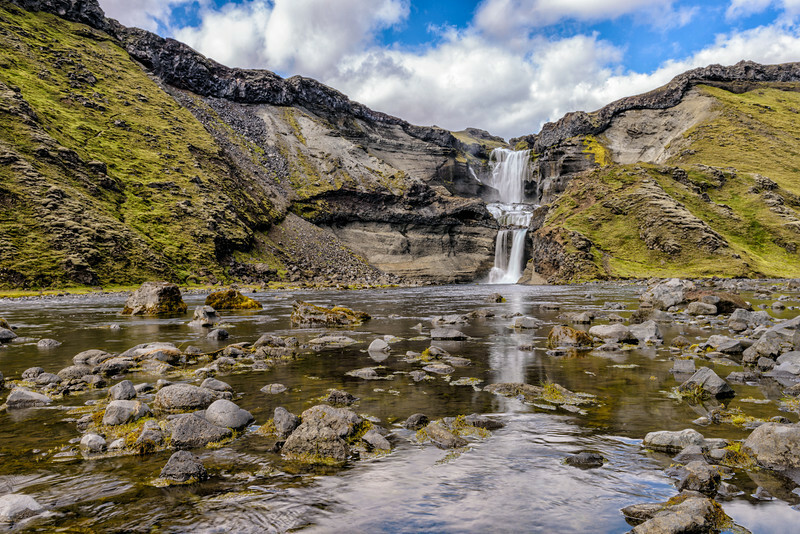 Despite its limited volume of water, Svartifoss is a very popular waterfall in the Skaftafell National Park. 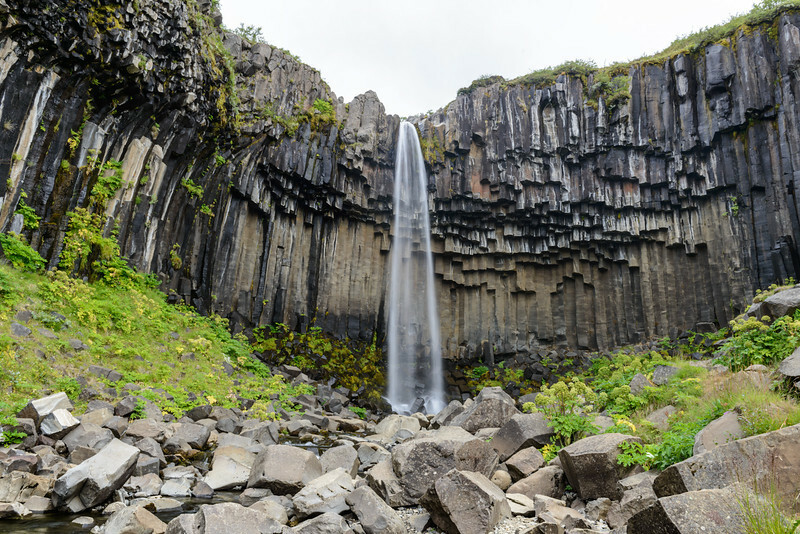 Its black hexagonal basaltic columns, which regularly fall off, make it for a very different waterfall experience. 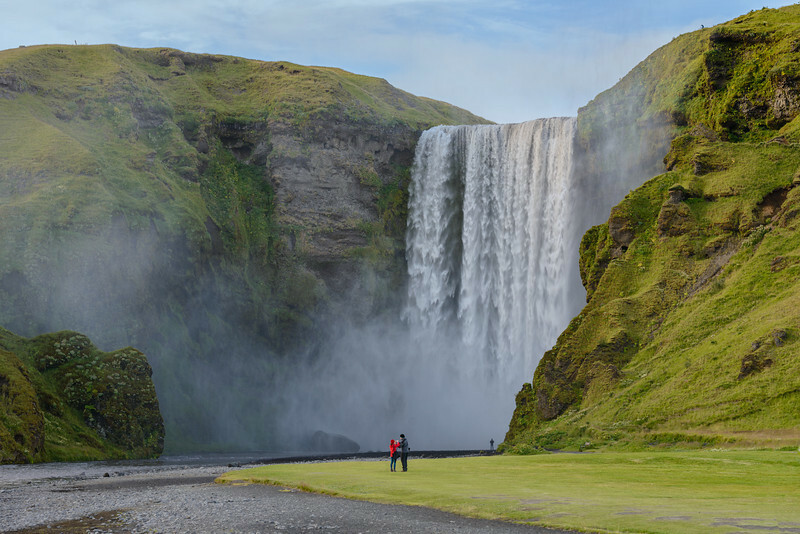 Along the South coast we find Skogafoss. 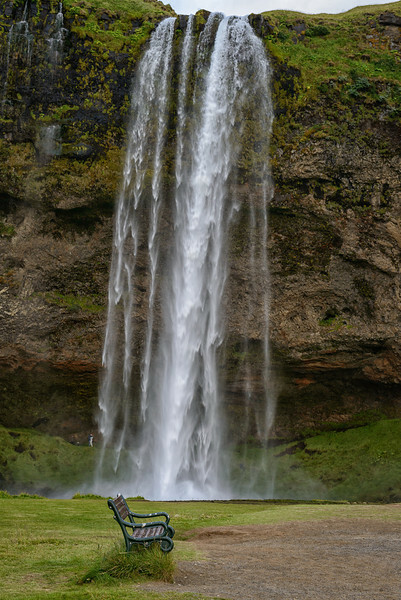 With a drop of 60m (200ft) one of the higher ones in Iceland and surely worth a visit. Not wanting to photograph this piece of nature with hundreds of tourist in front of it, I decided to do it late at night. I do like how the few people give it a good sense of scale. The best for last... 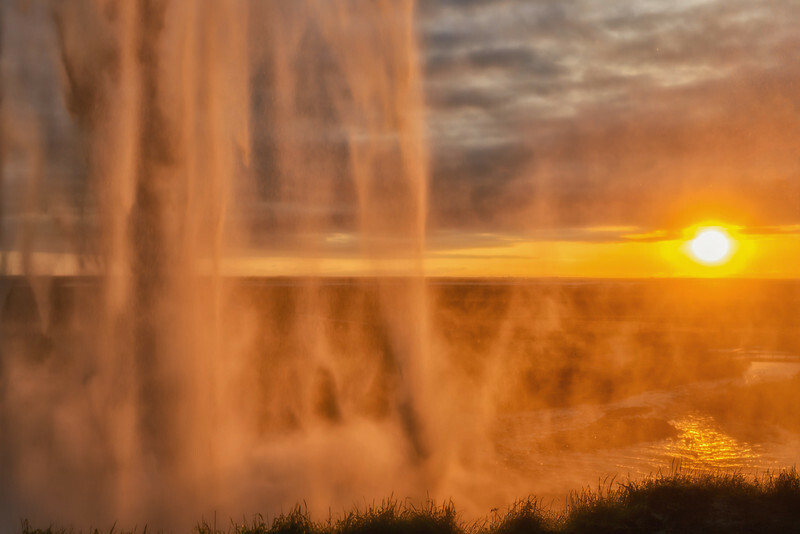 The fact that one can pass behind the fall, makes Seljalandsfoss very special! It was an emotional moment, when the sun eventually broke through minutes before sunset. A few days later I developed a heavy cold, but it was surely worth the wait! Iceland, we were strangers when we first met, but after one week it looks like we will be friends for life! I won't say good bye but see you later! The afternoon today, was spend editing some images of a great aviation event in Belgium, I attended on Saturday August 18. 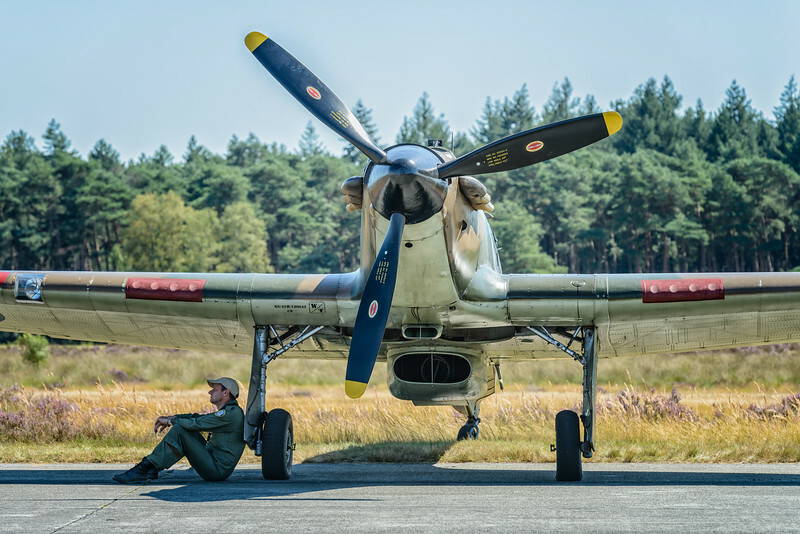 The PhotoFlying days at the disused military Zoersel-Oostmall airfield, brought aircraft owners and aviation photographers together with the aim of mainly photographing them where they belong, in the sky! Unfortunately I was not able to attend the "PhotoFlyings days Academy" which concentrates on the Air to Air photography, but I did manage to fly a single engine Robin into Zoersel. This allowed me to photograph some of the vintage and warbird aircraft that were there, including two DC-3 Dakotas, a rare Sikorsky S-38 Flying Boat, a couple of Grumman Avengers, T-28 Trojans, P-51 Mustang, Yak-52's, a Yak-18, a Spitfire and the Hawker Hurricane below. The image of the Hawker Hurricane with its pilot (or crew chief?) resting under the wing, gives me a real World War 2 feel. Most people think of the Spitfire as being the icon of the famous Battle of Britain, but it was the Hurricane that was really crucial to the victory! The organizers of the event pay a lot of attention to the fact that the aircraft are not photographically obstructed by obstacles like fences and visitors. Something that is often not the case in events like this. Well done, guys! More images made on the day can be found in my "Vintage aircraft" gallery. 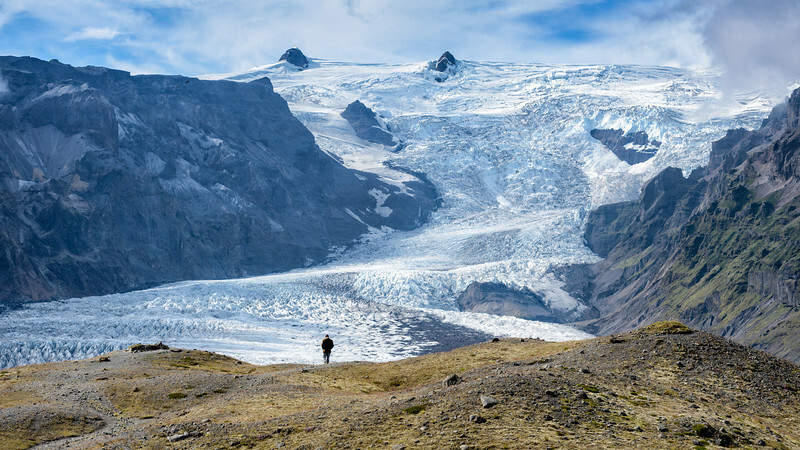 "Never in the field of human conflict, was so much owed by so many to so few"
About 400km East of the capital Rekyavik, we find the Vatnajokull, translated as "glacier of rivers". 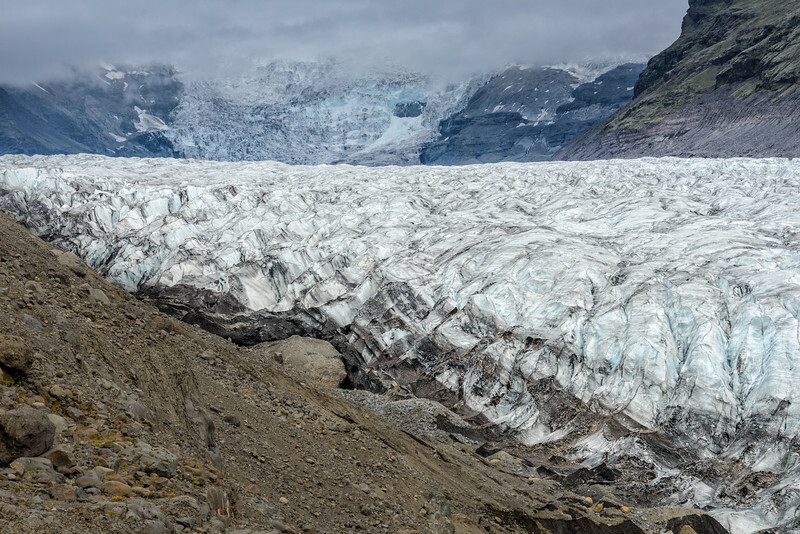 By area this glacier is the second largest in Europe and has a maximum ice thickness of 1000m! 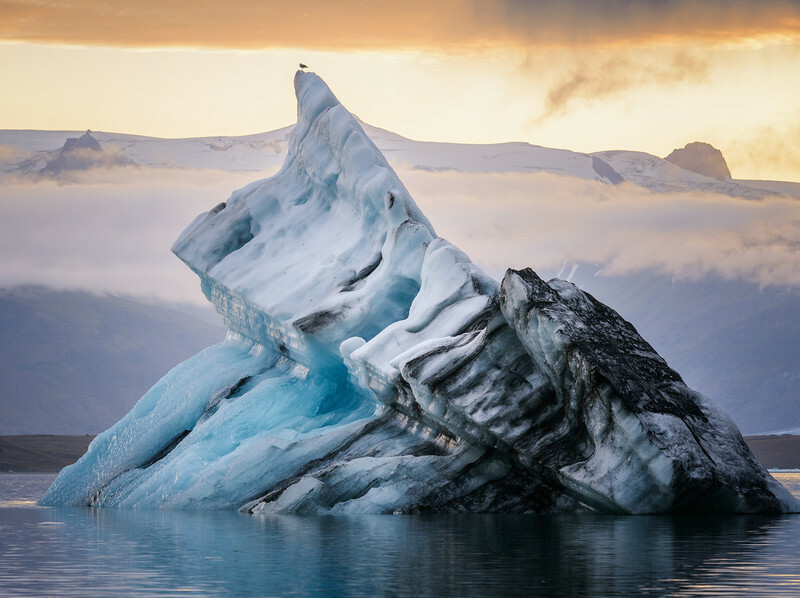 Just at the foot of the glacier, we find one of the most spectacular places in Iceland, Jokulsarlon. 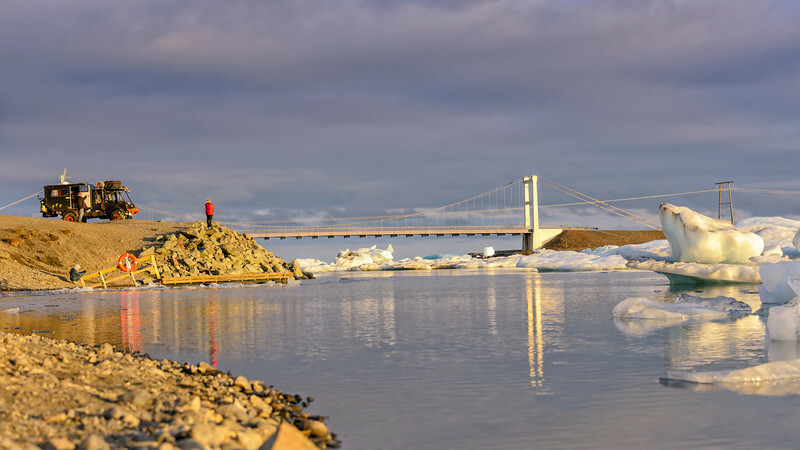 A glacier lagoon where one can see (and hear) the icebergs break off, before the tide takes them out to sea. 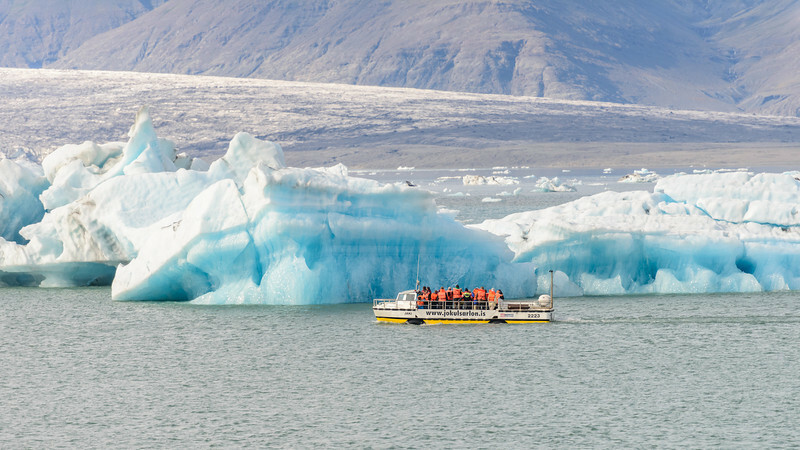 Boats take people out into the more than 200m deep lagoon but there is also plenty to see by strolling along the shoreline. It is especially around sunset that the place shows its real magic. 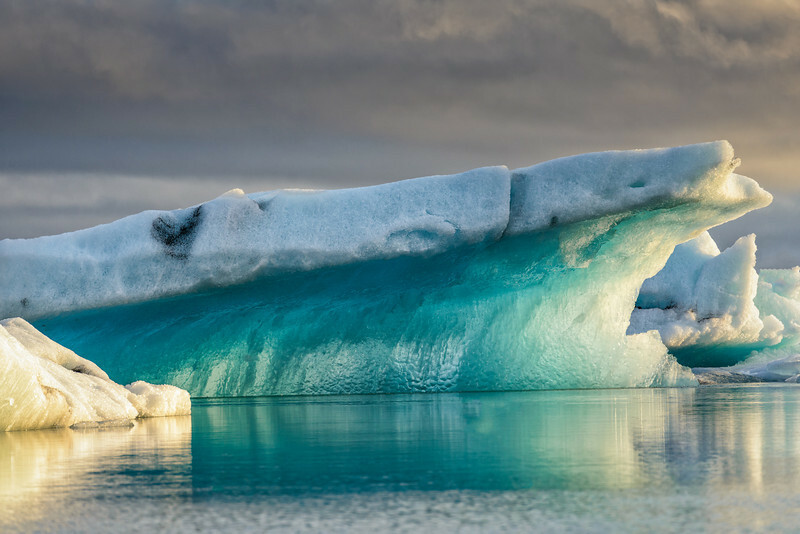 The contrast of the blue/green icebergs with the very soft orange light, will be engraved in every landscape photographers mind! About 10km West of Jokulsarlon I also stopped at Fjallsarlon. A smaller brother which is much quieter and should not be missed! 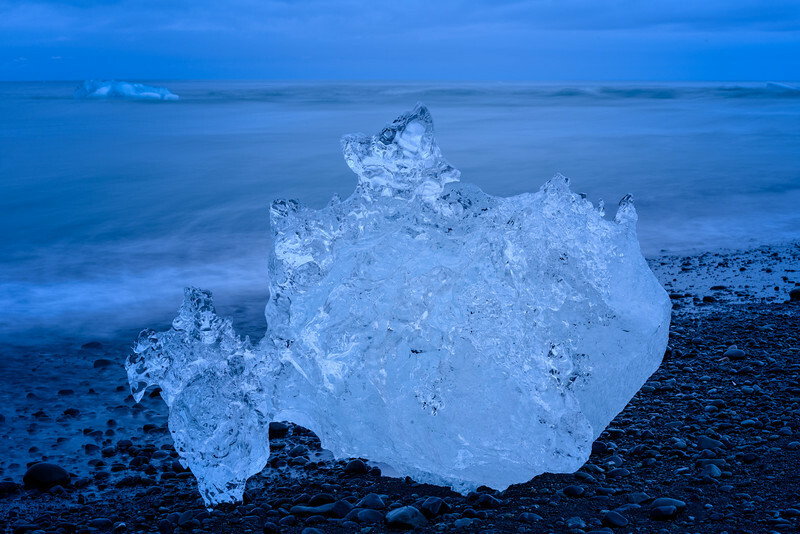 In total I paid three visits to the Jokulsarlon area, one in the afternoon, one around sunset till well past midnight and the last one the next morning. Having booked accommodation close by, allowed me to do this. Late at night after the tourists had gone, the place really showed its best to a good number of photographers from all over the world. It is especially the smaller pieces that can boost ones creativity and imagination. 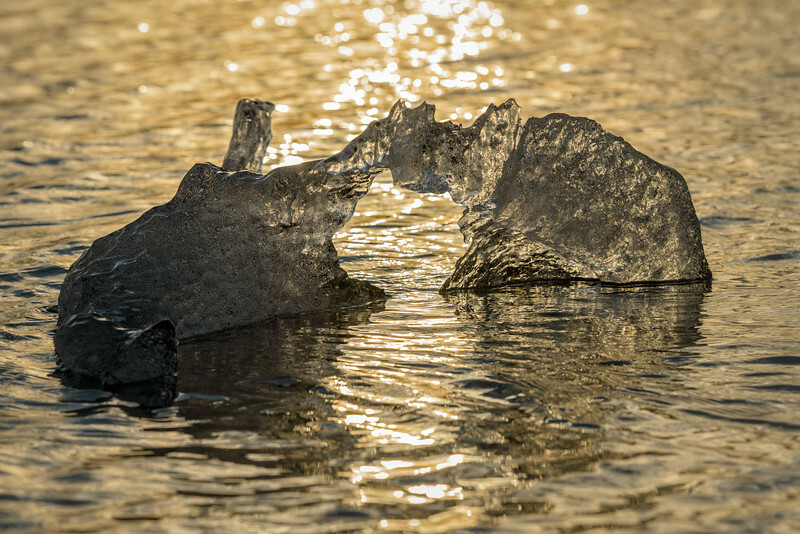 Post-sunset, I went to the nearby beach in order to shoot some ice coming back ashore. 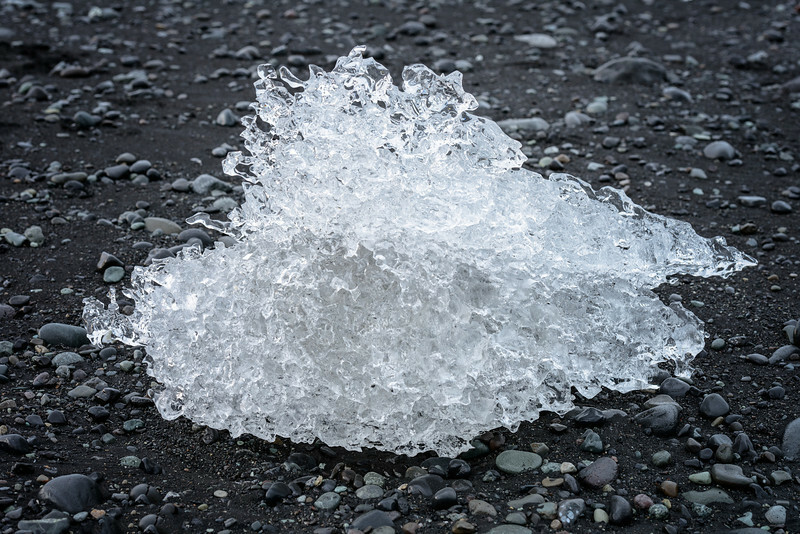 I was mainly attracted to the clear ice crystals on the black lava beach. 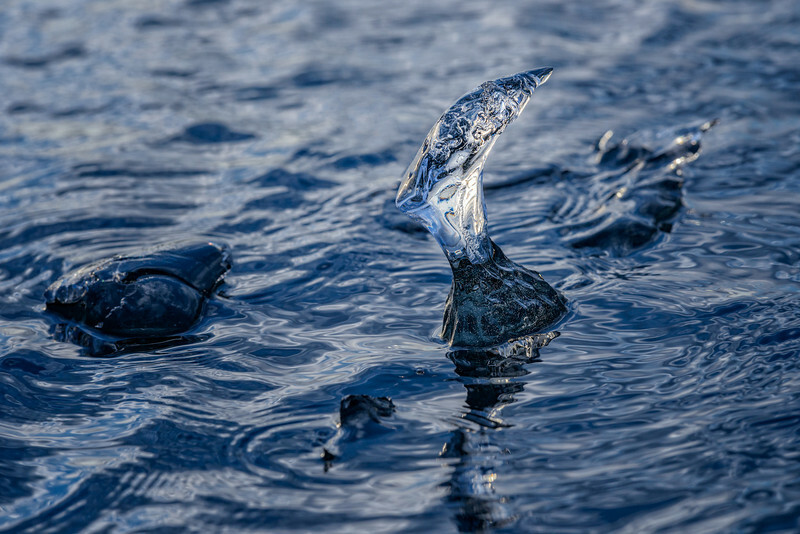 They are washed by seawater and are given an almost transparent appearance. 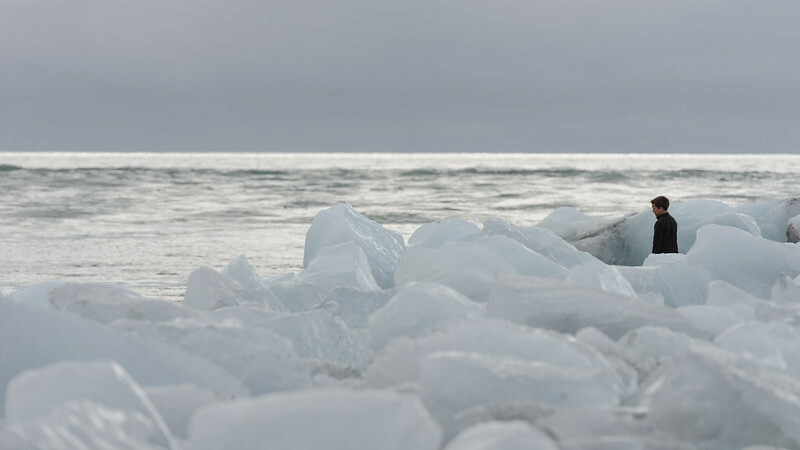 The next morning, high tide had covered the beach with melting ice blocks. 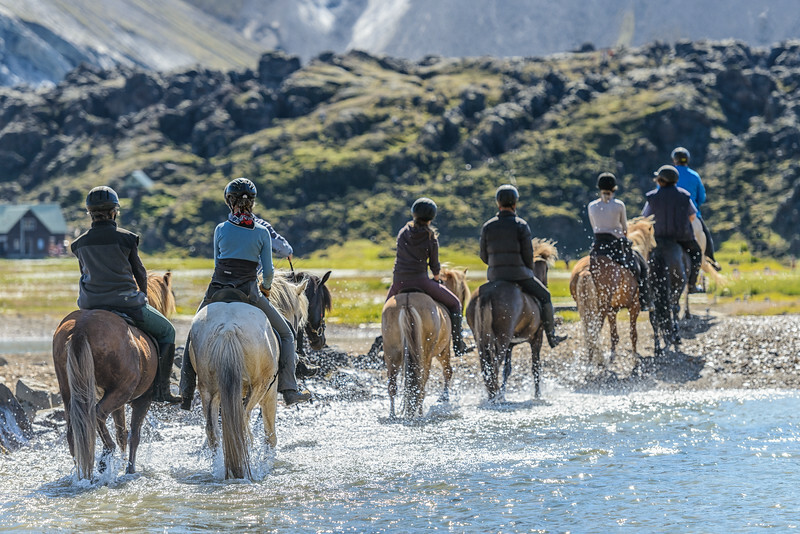 Even though I had high expectations to start with, this was clearly the highlight of my Icelandic photo-adventure! 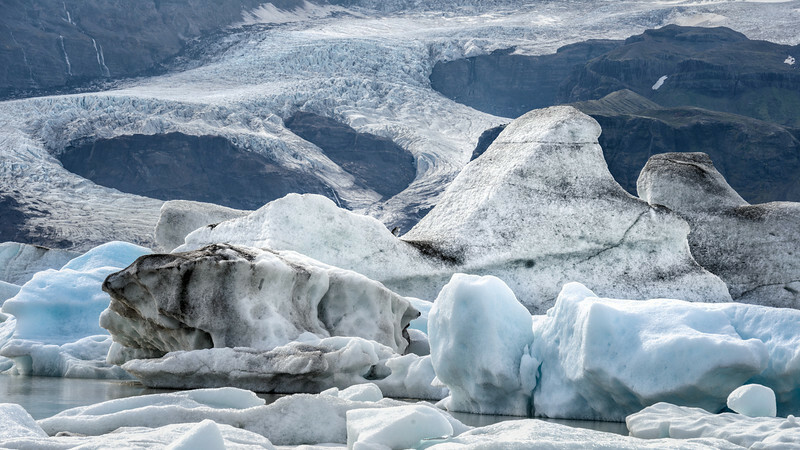 Welcome to the second part of the Iceland blogpost series. 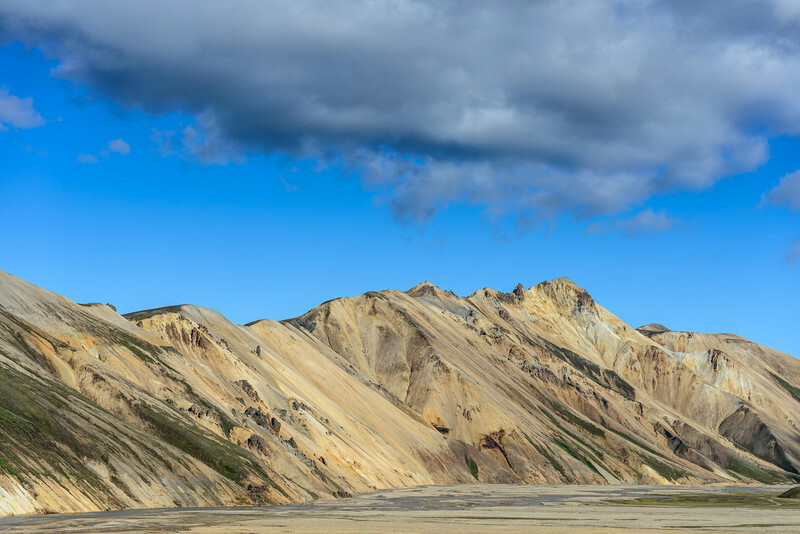 As promised, today the tour starts at Landmannalaugar, a remote encampment deep inside the mountains which is only accessible during the short Summer months (mid June to early September). The soft pastel colors really make this place a heaven on earth, especially with the great weather I had while I was there! 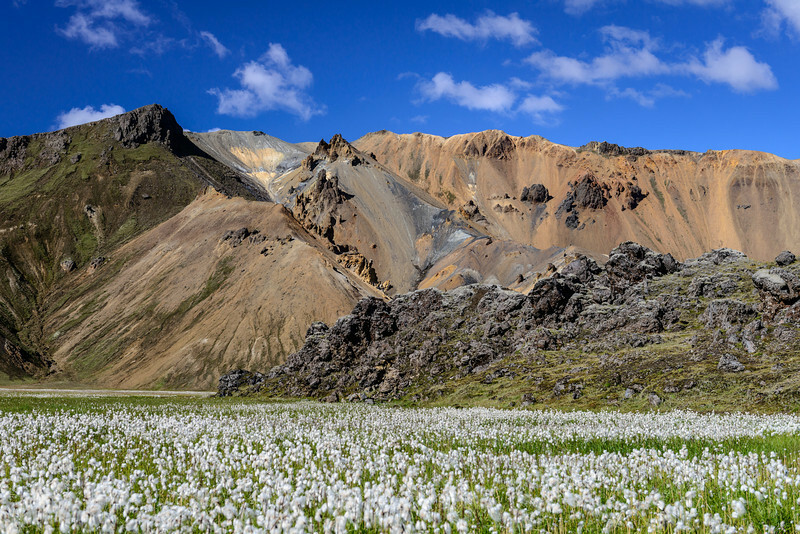 A nice one hour hike from the base camp brings one to this beautiful valley with wild cotton flowers. 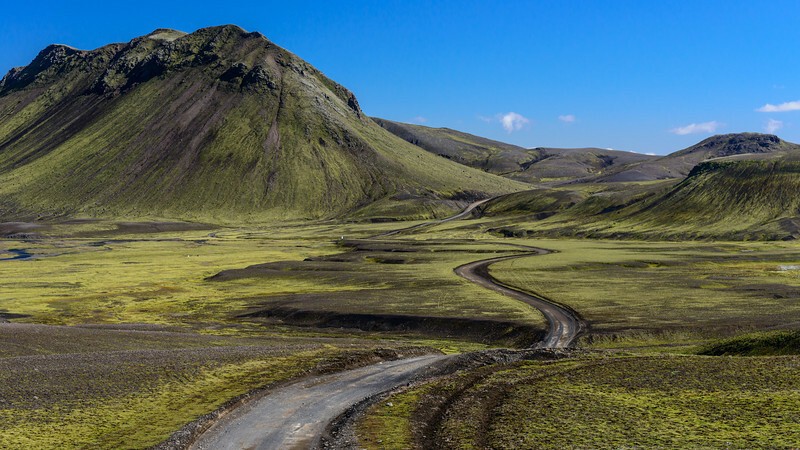 Although some people try to access Landmanna (as the locals call it) in normal cars through the North, a 4x4 is a must if one does not want to pay for a whole lot of damage when returning the car. The more exciting way is to follow the F208; a beautiful very bumpy ride through the mountains with numerous river crossings. South of Landmanna, I bumped into this amazing green moss valley along a small river. Can you image a better place for a picnic? And "no", the colors are not over-saturated. This is really how the place looked like! 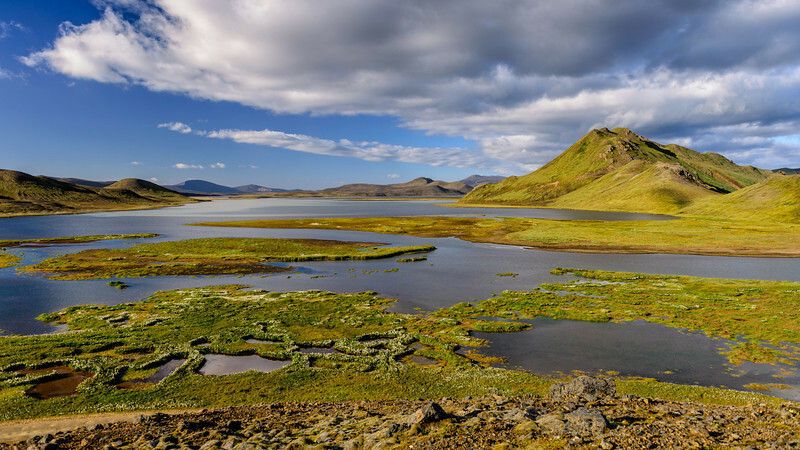 Even though one can hardly find a tree in Iceland, the landscape is very varied and is often very green. As one drives further South on the F208, the valleys starts gradually opening up. Reflections from an extremely deep blue sky, gives the water this great dark color. 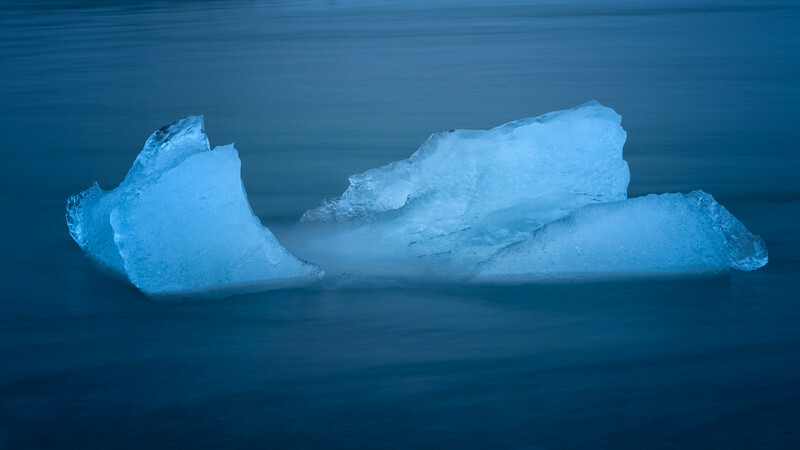 At least now I know, why we always see water as something "blue". I'll end todays post with the image above of a lake close to Landmanna. After I climbed a small mountain on the lakeshore just before sunset, I realized why this country had been on my bucket list far too long. A heaven for landscape photography! On part 3 we will have a closer look at the "Ice" part of the series!